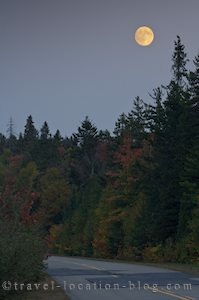 Wildlife and wilderness in Parc national de la Jacques-Cartier, and full moon over La Mauricie National Park in Quebec, Canada. in La Mauricie National Park, Quebec. After a long string of fine days, today dawned a little on the gloomy side. We headed back along Chemin de la Vallee in the Parc national de la Jacques-Cartier because we wanted to explore a few more of its hidden secrets. We drove in for several kilometres until we reached a parking area and La Pont Banc, a footbridge which serves as a starting out point for several day or multi day hikes. Riviere Jacques-Cartier was like a mill pond! At this point it widens and slows its pace, the fall colours of the surrounding forest seem to seep onto the watery canvas in reflection - and all was still. That was until a bus full of school children arrived to have lunch. The children leapt from the bus in giddy excitement - thrilled to be out on a field trip! They spread themselves out and claimed their own special spot, with some taking a place on the foot bridge then tucking in to homemade sandwiches and a carton of juice. We wandered through the crowd of children and over the bridge and started along a trail which skirted the river banks. There was so much here - lush, green moss claiming all sizes of boulders, a carpet of colourful leaves soft under our feet, and the sound of trickling water as the river lapped at the soft banks on its lazy journey through the valley. Then one by one they came - tap, tap, tap on my head - small droplets of water falling through the forest canopy. When their pace quickened, so did ours - we headed back along the trail towards the camper to take cover and wait until the shower eased, if it would at all. As we scurried across the bridge, we noticed that the children had completely vanished and all that was left was the odd piece of cling wrap and juice carton. Luckily a short time later the showers abated and we were able to resume our hike. We wanted to find a place along the river bank which was open enough to see across to the other side - the reflections of the fall colours on the water surface were just amazing! Eventually we found what we were looking for - a small beach, really only big enough for the two of us to stand on with a clear view. While we were standing admiring the view, some movement caught the corner of our eyes. It was on the other side of the river and as we trained our eyes for long distance - we saw a moose cow with her calf in the river. It was so nice to see! I love moose - they are such a fascinating animal to watch ... almost comical with their long gangly legs, huge snouts, and radar ears!! At that moment we heard (before we saw) some of the children from the bus. They had been loaded into a super long canoe and were paddling down the river, which obviously required a lot of chatter. We wanted to be sure that the kids could see the small moose family (as well as save the moose from being startled), so we waved our arms frantically at the adult at the helm and signaled for them to keep quiet. After a couple of attempts they finally realised we weren't barking mad and got the gist of the message we were trying to convey. The children were immediately hushed up and as they rounded the corner we heard their exclamations of joy ... in very soft voices. It was time for us to move on then, so we headed back to the camper and drove back along Chemin de la Vallee to exit the park. Our next location was La Mauricie National Park of Canada. Unfortunately with the sky filling with clouds - it didn't make for a terribly exciting show as we drove through the park. Although, we stopped in at the Le Passage Lookoff for a view over the surrounding forest and lakes. By the time we'd walked the 2-5 minute trail, the sky had cleared long enough to allow the setting sun peer through the clouds. It was actually quite magical - even if it didn't last long! We continued along the road, and caught a glimpse of the full moon through a patch of clear sky in the clouds. The bright moon (which appeared yellow) seemed to light the road up. We pulled into the La Mauricie National Park campground and set up camp for the night. At least during fall the nights are getting earlier.